The Skinny: Those looking for high thrills and comedy better look elsewhere. However, on a rainy quiet afternoon, and for fans of the first two movies, this isn't a bad film. 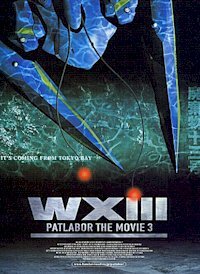 The first Patlabor movie not directed by Mamoru Oshii, WXIII (Wrecked 13) is the latest film adaptation of the popular and long-running Patlabor anime series. Ostensibly another giant robot show, Patlabor broke convention by being less about giant robots and more about human interaction through a mix of social satire, political drama, and situation comedy. It followed the exploits of Special Vehicles Division Two (SV2), a maligned and under-funded police labor (construction robot) group mandated to investigate labor crime. The show  and the movies  take place in a Tokyo parallel to ours where everything is as it is now except for the introduction of large, useful, and potentially destructive robots to a society not quite sure how to cope with them. Wrecked 13 doesn't follow the characters from the series or other movies. Instead, it concerns itself with a pair of detectives (Goto and Hata, otherwise minor characters from the series) investigating a number of attacks on labors in Tokyo Bay. After following the trail for a few days, the detectives learn the hard way that there's a monster in Tokyo bay and that it has a voracious appetite, killing two policemen and nearly the detectives. But where did the monsters come from? In keeping with the first two movies, the plot of how the monster came to be in the Bay is rooted in corrupt politics, underhanded corporate dealings, and personal agendas. Also like the first two movies, Wrecked 13 is a mood piece, meditative and heavy with only a few moments of action and even less humor. The plot is also more obtuse. The explanation of the monster's genesis is rooted in a lot of details that do more to sound impressive than actually explain anything. Among the mysteries are the reasons for which the monster was developed in the first place, or whether it was even truly an accident (a plane crash) that led to its release into Tokyo Bay. There are also a number of other peripheral plot points that seem more misleading than enlightening. In general, the story isn't knit togetherl, following paths that seem arbitrary. Plot conveniences  like the younger detective developing a relationship with a woman who knows a lot about what's going on in the Bay, or the discovery of what motivates the monster to attack  occur for no other reason than to push the story forward. That being said, as a mood piece the film works well. The scenes of the detectives performing their investigations are very good, as is the odd relationship between the two. There are also a handful of standout scenes. The detectives' first encounter with the monster is fairly gruesome and suspenseful, and a scene where a politically-motivated disinformation/news conference is intercut with a more factual detectives meeting across town is particularly well done. And the end sequence, as the SV2 faces off with the monster, wraps up the story neatly, if not bleakly. The animation here is sophisticated. The lighting throughout is naturally subdued, and generally point to an obviously well-fed budget. Sunlight dapples through leaves onto the walking detectives, reflections bounce off windows, and objects cast shadows. Likewise, the incidental sounds are very natural and seamless with the appropriately unassuming soundtrack. The voice acting is excellent, except for an English-speaking part which is nothing less than unfortunate.